Three female artists representing three generations of one Inuit family present an unforgettable counterpoint on the development and current life of contemporary indigenous women. These women are a grandmother, Pitseolak Ashoona (1904–83), her daughter Napachie Pootoogook (1938–2002) and her granddaughter Annie Pootoogook (1969–2016), of Cape Dorset, Nunavut, Canada. The three artists are the subject of Akunnittinni: A Kinngait Family Portrait, an exhibition of their prints and drawings, originally organized by the IAIA Museum of Contemporary Native Arts (MoCNA) in Santa Fe, N.M., and currently on view at the Smithsonian’s National Museum of the American Indian in New York. This collection of 18 works strikes what curator Andrea Hanley (Navajo), MoCNA membership and program manager, calls a “visual conversation” between the family members. The idea for the exhibition formed when Hanley took a business trip to New York City with Patsy Phillips (Cherokee), MoCNA director. There they met with Hanley’s longtime friend, retired teacher and Native art collector Edward Guarino, to look at his vast collection of works by Inuit artists. Guarino has collected Native art for nearly 40 years and began to focus specifically on Inuit art around 20 years ago when he first chanced on the art of Janet Kigusiuq, an artist from the area of Baker Lake, Canada. She amazed him, he says, with her use of the Inuktitat language, multiple perspectives and the sense of life and movement she created. “I have more works by Janet Kigusiuq than any other [Inuit] artist, but over the years I sort of flipped and am more interested in works from Cape Dorset nowadays,” says Guarino. As Hanley and Phillips continued to look through Guarino’s collection (much of which was stored in archival boxes under his bed, in true New York apartment fashion), it became clear they wanted to do a show that concentrated on Pitseolak Ashoona, Napachie Pootoogook and Annie Pootoogook. Even before seeing Guarino’s collection, Hanley had particularly admired Annie’s work. Eventually they chose six works each for Napachie and Annie. But for Pitseolak Ashoona, they reached out to Will Huffman, marketing manager at Dorset Fine Arts in Toronto, Canada, the marketing division of West Baffin Eskimo Co-operative. Located in Cape Dorset, the co-operative is unique among the Arctic cooperatives for its focus on the arts and artists of its community. Guarino is quick to credit Dorset Fine Arts and the West Baffin Co-operative for keeping the practice of Inuit art strong. Once the 18 works in total were chosen, Hanley searched for an Inuktitut word that connected them together. 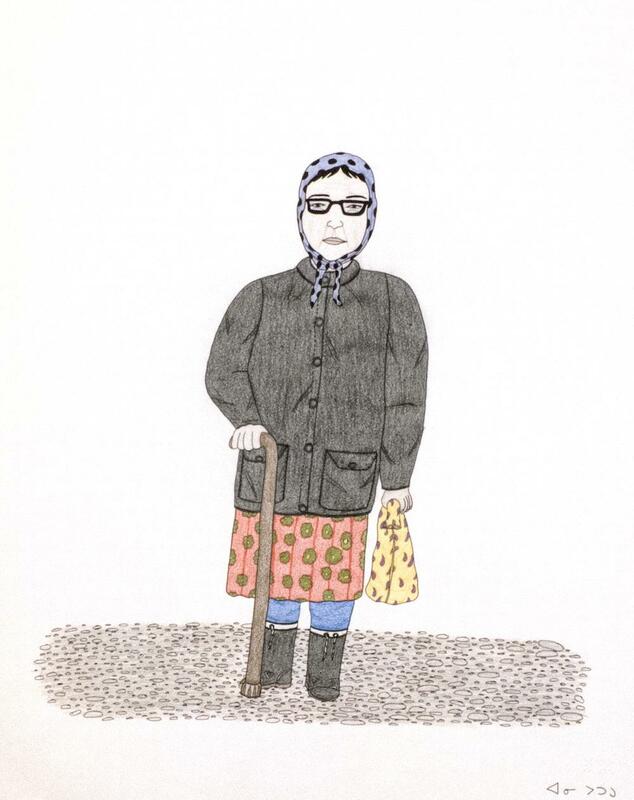 Akunnittinni, which translates in English loosely to “between us,” was the most accurate representation of how she felt the works communicated with each other. Each artist’s set offers very different messages about Inuk life and culture. In Akunnittinni, the unbridled romanticism of Pitseolak Ashoona, who had 17 children, is illustrated primarily through images of family and motherhood in works such as Family Camping in Tuniq Ruins or whimsical remembrances such as Games of My Youth. The matriarch centered on optimism and positivity in her work, a practice which began mid-life for her in the 1960s, with the encouragement and support of the West Baffin Co-op. A prolific artist, her overall oeuvre includes some 9,000 works. Napachie Pootoogook’s exploration of Inuit culture takes a very different turn and is markedly noticeable among the works in Akunnittinni. In particular, past subjugation of women is brought to the forefront in works such as Whaler’s Exchange, Trading Women for Supplies and Male Dominance. One work even examines the devastating effects of historical famine in Inuit communities. In Eating His Mother’s Remains, a man resorts to cannibalism in the throes of extreme hunger. Annie Pootoogook’s work is often also known for not shying away from controversial topics. Though not showcased in this exhibition, her works have approached serious issues such as alcoholism and domestic violence. 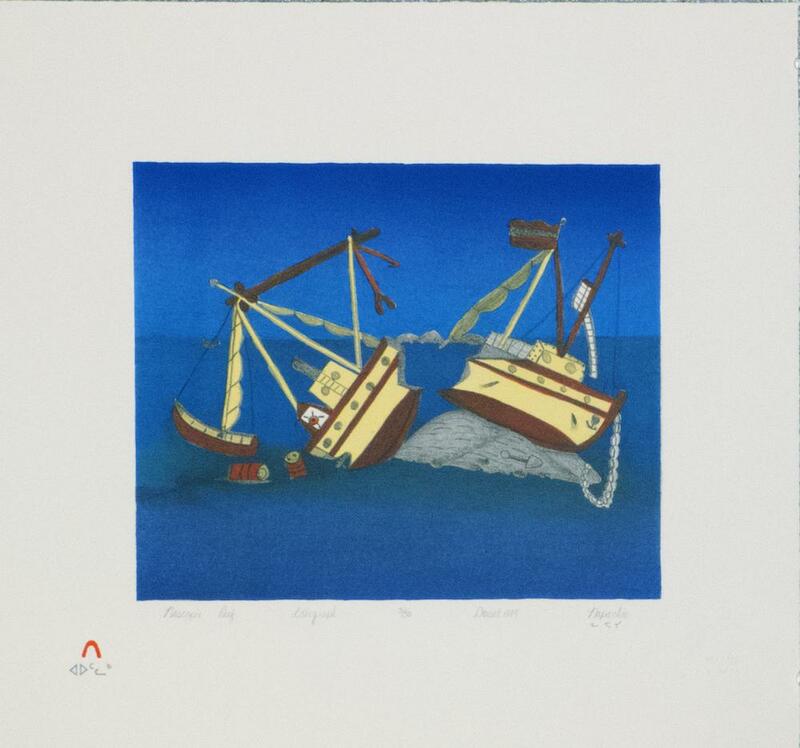 Her modern emphasis also marks a departure in much of the traditional Inuit body of work. 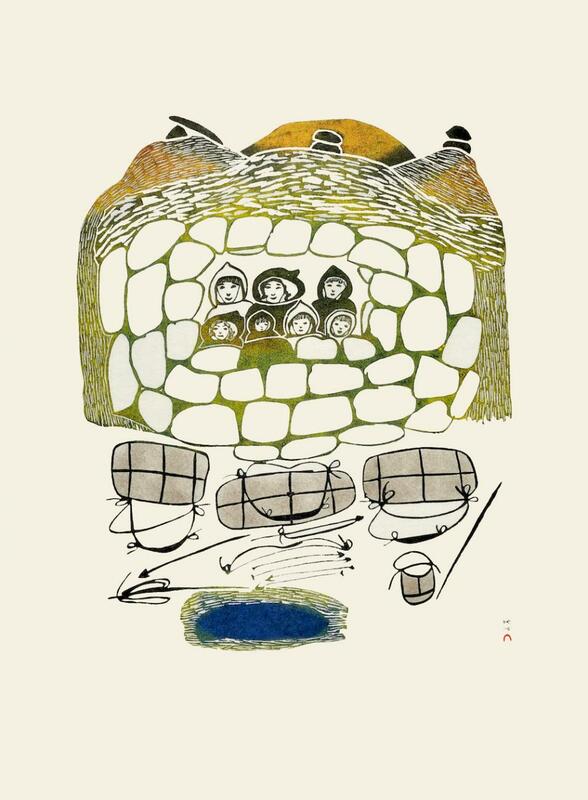 In Akunnittinni, her works underscore day-to-day contemporary Inuit life. The heartfelt scenes of Couple Sleeping and Drinking Tea are powerful in their exquisite embrace of the ordinary, but perhaps most endearing of her works in the show are A Portrait of Pitseolak and Pitseolak’s Glasses. According to Huffman, exhibitions such as Akunnittinni serve a much-needed function within the broader art discourse. Akunnittinni: A Kinngait Family Portrait runs through Jan. 8, 2018, at the National Museum of the American Indian’s George Gustav Heye Center in New York. Joshua Voda is the public affairs specialist for the National Museum of the American Indian in New York.